Who owns the truth? In Poland almost everything is political. It makes quite a difference whether you read the leftist-progressive newspaper, or whether you let a rightist-conservative journalist explain the world to you. Both camps are often diametrically opposed. Even though the older generations were once each others brothers in ‘battle’ against the communist regime. But after 1989 they drew opposite conclusions and each went their own ways. What does that polarization do to Polish society? To understand better, we wanted to take a look at it from the inside. Like a bull in a china shop – although well informed, not capable to truly assess each sensibility – we asked four Polish journalist to participate in a unique ‘experiment’. 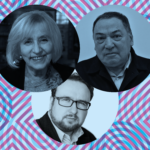 Jakub Majmurek and Marcin Makowski, two young journalists of opposite political orientation, each interviewed Janina Jankowska en Seweryn Blumsztajn, two journalists who during communism were active in the opposition, but they nowadays quite oppose in political preferences. 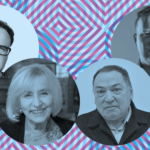 Fifty years after Polish students took the streets in March 1968 to demand freedom of press and fight censorship, the journalists discussed what came of it. This resulted in sometimes heated encounters. Below the story of Marcin Makowski, who favours more the rightist side of the debate. And read here part two of this series: the reportage of Jakub Majmurek, who is more a leftwing journalist. Look for the differences! Exactly half a century ago, the world was shaken by cultural and political tremors. There is no turning back from the 1968 revolution and its impact. History knows no precedence in terms of the scale and scope of the event. The generational revolt of thirty-somethings broke out in America, Mexico, France, Czechoslovakia, Poland, Germany, and the Soviet Union, even in China, India, and the postcolonial nations of Africa, everywhere under different names. They were born just after World War Two, and now they were contesting the prevailing norms, culture, and taboos. They were demanding freedom of speech. The flawed socialism and the increasingly militarized western capitalism were urged to show a more “human face.” Yet to some degree, this was an inconclusive rebellion. It was particularly clear in Poland after March 1968 that something had snapped, and there could be no more harboring delusions of a “Polish road to communism.” The timeless ideas for which they had fought became no less valid after independence was regained. I suspect that this disappointment, this feeling of powerlessness and “having lost what they were fighting for” also haunts my interlocutors. These were two participants in the 1968 Polish revolution. How do they now see their struggle for pluralism in schools and the first steps in creating a media independent of the government? Has something of the spirit of those times remained? Both are journalists to the marrow, but like many who fought arm-in-arm against the communists back then, they are somewhat distant from one another. Nonetheless, it may surprise that they describe the structural impotence of the contemporary media in practically the same words. Polarized, one-sided, wrapped up in a fatal love affair with politics and radical messages. These were the topics of my conversation in 2018 with Seweryn Blumsztajn (Workers’ Defense Committee, Solidarity, Gazeta Wyborcza; many times apprehended and arrested during the People’s Republic era) and Janina Jankowska (Polish Radio, Workers’ Defense Committee, Solidarity; interned during Martial Law). These conversations were bitter, yet sincere. “Was that youthful naivete?” I venture. “We knew there would be some kind of consequences, but we hadn’t calculated,” Blumsztajn responds. “Today, with less to lose, people calculate, and back then they didn’t?” I ask. And then, hitting the ball back into Blumsztajn’s court: “I don’t suppose Poland has ever been much for calculating.” To his mind, that March was “Polish through and through,” though attempts are made to turn it into a revolt inspired by young Jews. One thing nags at me, and I would like to understand. Why did that revolt, both in Poland and around the world, begin and end with students? It did not enthrall the masses, to whom it was largely aimed. Did it anticipate the spirit of the times? Blumsztajn spent a long time wondering how to respond. “There was a generational mystery behind this world-wide revolt. We were toying with freedom, it was clear we were pushing the envelope. We were checking how far we could go. Our eyes were only opened to its true nature with the brutal suppression of the student protests, the clubbing, the prison sentences. “And what if the authorities had not started pulling out the billy clubs?” “Then we would have kept operating on campus, at least in my opinion. We wanted to bring things to a head, to a point when they lost control,” Blumsztajn says. At the time many people, not just youth, had lost their faith in the media. “Freedom of speech, media, how did you define it at the time?” I say, getting to the core of our talk. “I remember that Kuba Karpiński made a name for himself at the first rally, at the Warsaw Polytechnic, by beginning to shout Życie Warszawa,” he laughs. “More intellectually advanced people were aware of their limitations. We read Trybuna Ludu, not to learn about the world, but to find out what the government had to say on the subject. About their point of view,” says Blumsztajn. “How did that shock affect us, the people who went on to create the underground media?” he continues. The long explanation that began with this question boils down to a simple, though intriguing conclusion. From the Workers’ Defense Committee Bulletin, to Solidarity media and the early days of Gazeta Wyborcza there was a continuity of language, based on a dry and reliable reporting of facts. “Only later did we begin making media. Commentaries, reportage, interviews. At the beginning we believed that we had to only speak in facts, without a shade of emotion. Separating them from the commentaries was meant to be an “antidote to the government propaganda,” he states. At that, we inevitably begin hazardously straying toward the present. “And after 1989, when your newspaper no longer prohibited commentaries, or rating and hounding politicians, did you never get the impression that you were overcompensating for the years of communism?” I ask. “The word ‘Gazeta’ carried a lot of weight at the time. We learned that a single opinion piece could break down coalition talks. We committed heaps of mistakes, there were lots of young people who suddenly felt influential. On the other hand, without much experience, we changed the whole Polish media market,” Blumsztajn boasts. Yet things cannot stay too rosy. We are back in 2018. The here and now. “When you presently see Wyborcza, when you observe social media, do you not feel as though other people are falling in the same trap?” I say, noting that my interviewee’s initially calm tone of voice has begun to grow more emotional. “The situation of the media in Poland is drastic at present. The public media has been taken over by the ruling party and is manipulated in a way comparable to the communist media,” he begins, and immediately adds that he consciously makes this equation when it comes to the language of propaganda, while stressing that the private media has remained unchanged. “But what if the changes in the public media are a response? The conservatives’ ‘revenge’ for years of liberal dominance?” I press on. “I find this change unnecessary,” Blumsztajn says, cutting the discussion. The atmosphere thickens. “The right-wing media narrative says we have the same propaganda today, but now it is done more subtly, with kid gloves. By a group who appropriated the transformation for themselves, and made it difficult for competition to emerge,” I say. “That’s your thesis, that’s a question that comes from the new reality,” my interviewee replies. “What do you mean, ‘group who appropriated.’ The only party that appropriated things was PiS, for God’s sake! The appropriation of the nomenclature is a myth. Where was the appropriation?” The old oppositionist is getting riled up. At one point, my voice still calm, I ask outright: “Do you consider yourself part of the post-transformation elite?” “Of course.” A moment’s silence. “Every journalist believes he belongs to the elite.” What I am after is a deeper problem, however, which the right-wing camp presently ruling Poland defines as the monopolization of the media by the post-Solidarity elite. To a large extent these were the same people who were at the core of the March 1968 activists, still speaking and writing in a similar, leftist-liberal tone. “I don’t know, but I would like to say that I met regularly with the Karnowski brothers, with Paweł Lisicki in other media. They were also part of the post-transformation elite, like Jarosław Kaczyński, who has spent years in parliament. Those people took over the media once already, in 2005-2007, and they showed they didn’t know what they were doing. Have a look at Bronisław Wildstein, their ‘star.’ What is that? Ideology kills talent,” Blumsztajn says, gesticulating wildly. “Do you suppose your own newspaper avoided that trap? The same one that regularly publishes ideological manifestos, and advises readers who to vote for on the front page?” I now say, laying my cards on the table. “But that isn’t propaganda like theirs. We are ideologically active. We are doing this because we believe the present government is destroying democracy. Political radicalization has also changed how the media functions. Of course, mistakes do occur, but I generally believe we are upholding the standards,” Blumsztajn defends himself, concluding that there is no such thing as “objective journalism” in our day. At best it can be honest and technically able. The kind that can give ground to the opposite side of the debate and give it a chance to speak. The telephone rings. Probably an invitation to a televised debate. “Yes, please send a car,” says Seweryn Blumsztajn, giving his address. The producer mentions who the other guest will be, but I do not hear the name. “He’s not really up my alley, but all right,” the editor says, and returns to our conversation. “Do you suppose that this is a moment of no return for Polish media? That there is no reset button and we can only try to outdo each other with our radicalism?” I return to the discussion. “Journalists these days are even more divided than politicians, because politicians at least have to work together in Parliament. Journalists don’t have to,” Blumsztajn concludes, and adds that to know how the media war will end, you would have to know how and when the political war will end. And this, unfortunately, no one in Poland can tell. “Doesn’t this race to be more radical ultimately hurt the opposition and its unity? Many young people are disappointed in the leftist-liberal media for playing this game, which discourages the more centrist voters. They point to you, the Solidarity generation. It’s sort of like 1968, right?” I throw in provocatively. “We are criticized from all sides. Not radical enough for the Committee in Defense of Democracy [KOD], too radical for the Razem Party. Yes, this is a generation conflict,” Blumsztajn decides. He does not want to end there. I sense this is a very personal subject for him. “They call us ‘old folks.’ But these ‘old folks’ noticed that the Constitutional Tribunal was being destroyed, and the young people didn’t. They only woke up when it came to the courts. I know why. When I go to meet with KOD, I call them the ‘revolution of the third age’ (laughs). Those are people in their fifties and sixties, the Solidarity generation, who remember the price of freedom. They feel like someone’s trying to take away the best years of their lives, to cross out that time,” he says. We have been talking for an hour already, I try to wrap things up. “But don’t you see the flip-side of things? How your generation talks down to the youth, calling them wet behind the ears? Doesn’t that remind you of anything?” I pause. “I don’t know, I don’t see it that way,” he says. “The 1968 generation has to step away?” he continues. “I’m already retired. The right-wing March generation is still fighting on. Jarosław Kaczyński, Antoni Macierewicz…,” Blumsztajn gets lost in thought. “When you see what’s happening today, do you think the fight made sense?” I end. “I woke up a month ago with the feeling that I had wasted my whole life. Everything I had fought for was wasted, crumbling apart. But I can join Adam Michnik in saying: “We devoted our whole lives to fighting for freedom for Poland, and what did the Poles do with their freedom? That’s not my business. That’s it,” Seweryn Blumsztajn says in farewell. We part courteously and I leave, passing the villas in the Żoliborz district along the way. I see unfurled European Union flags and KonsTYtucJA posters [a play on the word “Constitution” that inserts the words “YOU” and “ME” - trans.]. It is cold and dreamy. “Wonder what the weather was like that March,” I think to myself, and get on the train taking me home to Krakow. I go see Janina Jankowska on a Sunday, straight from joining a television program. Deep in the suburbs of Warsaw, my cab driver and I have to search for the driveway to a small, wooden house. I’m bringing some cigarettes she asked for. Before we get down to the conversation proper, I have a look around the room. Lots of family photographs, a fireplace: cozy. Here a pennant with the slogan: “The homeland, truth, dignity. Solidarity,” there a photograph with Pope John Paul II. Two dogs are asleep on the sofa nearby, a gray cat slinks by somewhere between us. Jankowska is in a bit of a rush, so we get down to business. “What motivated you to fight for freedom of speech in March 1968, when the price for standing up for your rights was incomparably greater than it is today?” I begin. “It would be hard to say that we were involved in the ‘media’,” because the free underground media had yet to exist. In some sense, it was only created through Jacek Kuroń and Karol Modzelewski, the group of young people who were the first to be jailed for their beliefs, after their parents in the Stalinist period,” she clarifies, entering a long historical explanation of the anti-Semitic genesis of the March events and the infighting in the Polish United Workers’ Party. “I don’t suppose I was fighting for freedom of speech back then. That would be an exaggeration. I was struggling for freedom in the 1970s, when I stood up against the rulers’ anti-Semitic witch-hunt. My boss was fired from the education board of editors at Polish Radio because of his Jewish extraction. Forefathers’ Eve was canceled, which we took as an offense. I was just rebelling against the times,” she claims. Unlike Blumsztajn, Jankowska was working in her profession during the student protests in Warsaw. She was employed at Polish Radio at the time. “Weren’t you afraid of losing your job?” I ask outright. “I wasn’t afraid that the radio station would fire me, I thought that I’d change jobs if I had to. I wanted to work at the Syrena candy factory, because it was near my house. I even dropped by, but they didn’t want to hire me, unfortunately,” she says. I frankly admit that I don’t believe her. How could she not have feared losing a job that was her passion? “I would have been upset, I’m sure, but that was when we were just getting started. I was much more hurt by losing my job after Martial Law, but by then there was a democratic opposition and an underground press,” she states. What really hurt Jankowska after 1968 was the attitude of some people who just went with the flow of the communist Party. “I recall that an acquaintance of my boss came to the office after the March events, he was the head of the University of Warsaw graduates’ union. He handed out calling cards, introduced himself politely, and then began blithely explaining who was a Jew. That you had to place a ruler between the ear and the nose and measure something. Clearly one of Moczar’s anti-Semites. Later we laughed him off in the office, but no one really thought it was funny,” she says bitterly. “That was a foul atmosphere. I saw this more clearly in the radio pieces years later. In those days people had narrower horizons,” Jankowska says, lighting one of many cigarettes she smokes during our talk. This time I decide to move on to the present more quickly. Yet history still inevitably returns to our conversation. “March 1968, March 2018. Media, propaganda, language. Do you see any parallels? Is this a trail worth following, or is it ahistorical?” I am purposefully throwing out many leads at once. I am curious about her first response. “You can accuse today’s press and television of many things, but for God’s sake, what is happening now has nothing to do with those times,” she stresses. Then she adds, “It kills me when I hear about the threat to ‘free media’ in our day. You can say that for the public media, of course, but on the whole, Polish media is free. Now they say that because they receive no state funding there is no free media, but that’s crazy. Krytyka Polityczna doesn’t get it nowadays, and previously the conservative periodicals weren’t funded. Every government has its own policies in this respect, but it’s stupid to confuse it for a lack of freedom,” she says, with passion in her voice. Things look less bright when we get down to details. “Today’s media has a different problem,” Jankowska begins, even without my prompting. “Today there’s an atmosphere of zero trust, back then there was clumsy propaganda and attempts to unmask it by journalists who thought differently. The only thing that binds our two epochs is the tendency to build the trust and strength of your camp by pointing to the enemy. Unfortunately, Jarosław Kaczyński is responsible for this state of things; he forces us to live in a state of perpetual revolution and tension. Meanwhile, a state is continuity. If the previous group made mistakes, they have to be fixed, but you mustn’t throw out the baby with the bathwater,” she moans. A moment later she begins to explain what brought her to the right wing. “I knew President Lech Kaczyński in the old days. We were on familiar terms, I worked in his office. He was the first to say that we had to recognize the anonymous activists of Solidarity, the people who never made the front pages of the newspapers. Lech was totally different from Jarosław. Filled with the pain of losing his twin brother, Jarosław focused all his energy on disdain for the government during the time of the catastrophe,” Jankowska claims, though she stresses that one must be cautious with such psychological evaluations. “All that’s bad in today’s politics comes from Jarosław Kaczyński?” I ask. “Of course not, but the right-wing camp was on the sidelines for most of the post-transformation era, and Kaczyński built a sense of power that came from fighting the enemy of his system. This meant he gathered politicians and journalists who thought in the same categories. That gave rise to the present conflict,” she claims. “All right, but it takes two to tango,” I say, pointing out that the right-wing media initially grew out of a niche, and public debate was almost entirely orchestrated by left-wing and liberal publications. “True, it takes two to tango, and the anti-PiS camp also uses radical modes of expression. It sees nothing positive in the right wing. Some even say that ‘the worse the better’,” says Jankowska, and then moves on to what she sees as the source of the problem. “Why are we again falling into the trap of using media for political aims?” I ask, lifting Jankowska’s cat from the keyboard of the laptop I opened to take notes. “I think that’s another trap. The trap of struggling for power. The result is the political scene in Poland at the moment. It was created through an intense battle for influence. Who knows, maybe this is part of democracy? All the instruments of one side and the other are subordinated to this aim, and not to the interests of Poland. This is the tragedy. It is necessary to take a stand, and if people want to take a middle road, they are accused of symetrism,” she says, with sadness in her voice. A moment later she continues. “After toppling communism, journalists should recognize the virtue of freedom. Journalistic honesty means hearing opinions unlike my own. People have stopped inviting me to speak for some time now, it is getting harder to make criticism heard,” she concludes. “That’s an excellent question,” I say, a bit thrown off guard. “As long as no one tells me what I have to write, I’m happy.” We say goodbye, and I return once more to Krakow. Only in the train do I realize that, though neither one of those conversations encouraged optimism, I am not depressed. On the contrary, I have the impression that I understand what motivated people then, and what should motivate us today. Perhaps the media will always be polarized, ready to make deals with the government, to take shallow shortcuts. But I myself, along with my colleagues, make up that media. And to a large extent it is not the “system,” but our individual standpoints – as with the people of March 1968 – that will decide upon how we write our page of history. The point is not to suddenly disavow our views. The thing is to do our work in a way that is faithful to the craft, honestly and to the best of our ability. This, at least, has not changed over these fifty years.